Awhile back I picked up a VHS copy of I Was A Teenage Zombie. It’s campy as hell and from the ‘80s, so needless to say I like it. There’s a scene where the main character Dan Wake, who’s a star high school baseball player, has a daydream of sorts of his baseball glory all the while his buddies are getting pummeled by the local weed man Mussolini and they're begging “Dan” to help them out by taking batting practice on Mussolini. I thought that would make for a cool -if not super obscure- custom baseball card. 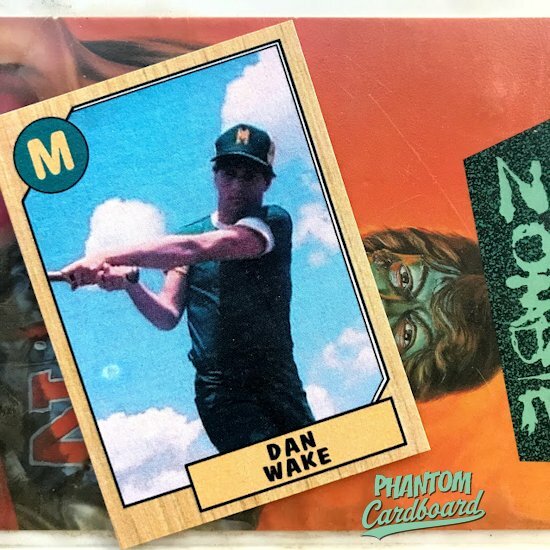 Since I Was A Teenage Zombie I was excited to use the woodgrain 1987 Topps baseball inspired template again. The biggest obstacle I was faced was getting a clean image. The movie itself can’t be found a very clear picture. It’s available on DVD, but I don’t think it’s ever been actually ‘digitally remastered’. The image you see is the best I could do out of dozens of attempts to capture a clear image. I don’t recall the high school in the movie ever being referenced let alone a mascot of logo. So, for the logo I just copied the simple “M” on Dan’s hat. It’s interesting because the Zombie on the VHS cover has a letterman jacket with an “N” on it. I don’t think they were concerned about the accuracy on the custom trading card I would be making 30 years later.